Once client has selected a winner and the design result has been handed over and received well by both designer and client, then client will proceed to closing contest fully. Designer will then be able to request a "Payout" that is available at the Balance page. 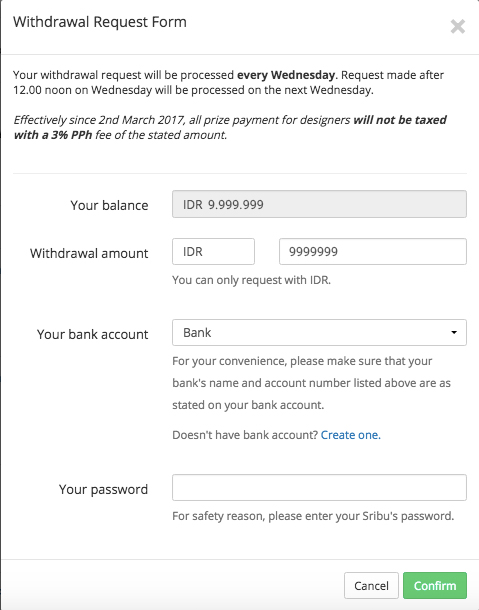 Enter the amount you wish to cash out (minimum withdrawal IDR 200,000,-), choose the bank account you wish to use, key in your password to validate payment. Then, click " Confirm". Sribu will process all prize/reward payout as per the amount the designer has requested on every Wednesday. All payment will be directed to the designer's account since the date of payout processing (on every Wednesday) within 1-3 working days.